Classic Greco-Latin Plays come back to life in the magnificent stage of the Roman Theatre of Mérida. It has a great prestige due to the combination of theatre, culture and all the well-kept Roman Heritage. 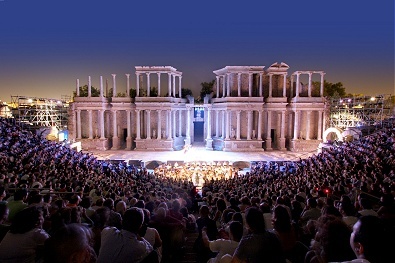 Mérida’s Classic Theatre Festival is the most important classic festival in Spain, it has great prestige due to the combination of culture, spectacles, and above all the well-kept Roman Heritage. Along the whole summer, from June up to September, there are many events related with this festival: conferences, exhibitions, seminars, and other cultural activities.. The oldest Greco-Latin theatre Festival in Spain was born in 1933, that year the actress Margarita Xirgu performed the role of Medea written by Eurípides. The famous writer Miguel de Unamuno adapted the text for the representation, and Cipriano Rivas Cherif directed the performance. 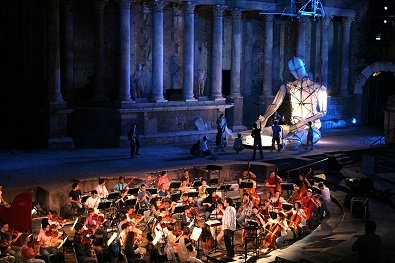 Along those years, other artistic expressions such as Opera, Ballet, or Classical music have been added to the programme, all of them are related to the Greco-Latin world, the main feature of the festival. The Theatre has been the stage where great actors and directors from Extremadura, Spain and the rest of the World have performed. All of them have tried to bring back to present day the grandeur of Classical plays, where humour was mixed up with satire and social criticism. The visitor gets into a marvellous atmosphere surrounded by the ancient Roman Theatre and Amphiteatre.